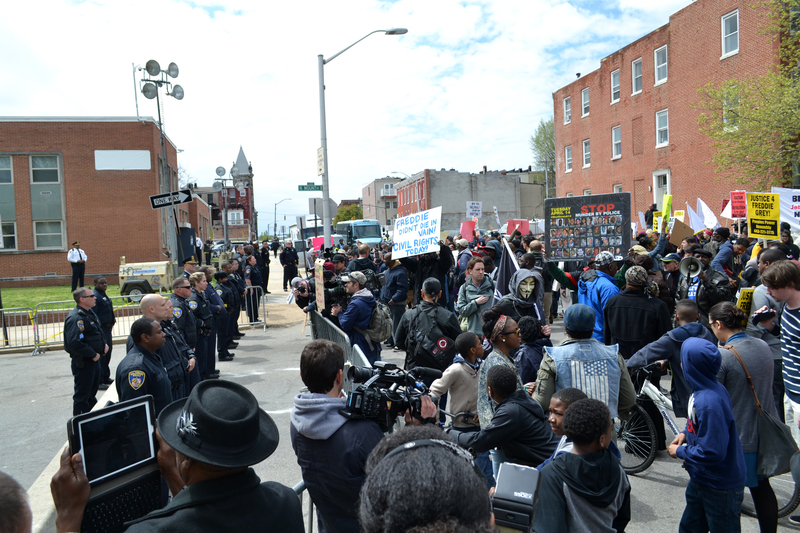 Demonstrators protest the death of Freddie Gray at the Baltimore Police Department. As demonstrators continue to fill the streets of Baltimore in the wake of the mysterious death of Freddie Gray, the 25-year-old African American man who died while in police custody, many are drawing comparisons to the conditions that sparked protests in Ferguson, Missouri, following the police shooting of unarmed teen Michael Brown last year. Robert Kane, PhD, professor and head of the criminology and justice studies department in Drexel’s College of Arts and Sciences, in the Christian Science Monitor. Read the full article here. Kane also spoke with Yahoo! News, saying that Baltimore and Ferguson have a great deal in common despite their difference in size. “Both places tend to be characterized by a fair amount of what we would think of as disadvantaged inner-city African-American communities,” Kane said. 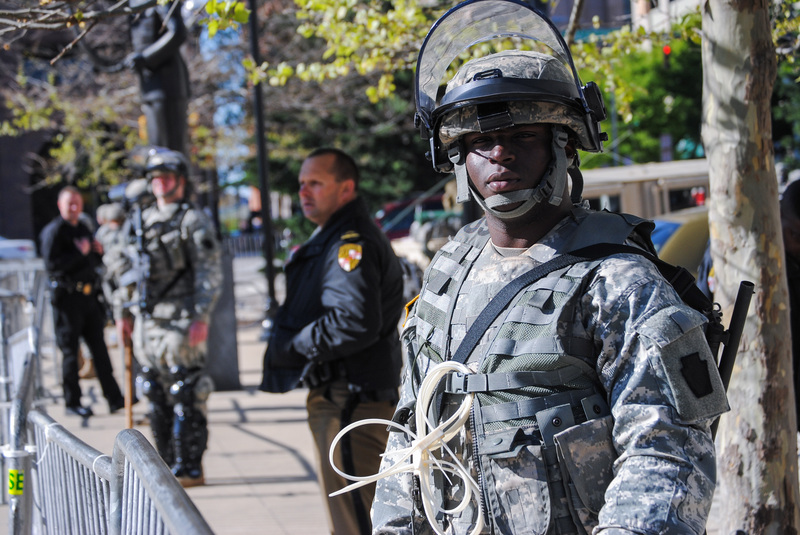 A Maryland Army National Guard soldier keeps watch in front of Baltimore City Hall. He also cites social media’s role in galvanizing the protestors. “Mass communication can make a very large country feel small. People in Ferguson can feel right at home in Baltimore because they are seeing what happened, more-or-less, in their city less than a year ago.” Read the full article here. 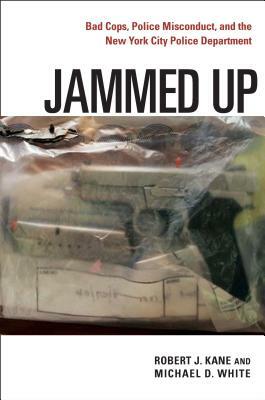 His previous book, “Jammed Up: Bad Cops, Police Misconduct, and the New York City Police Department,” is the definitive account of the nature and causes of police misconduct. To date, this was the largest and most comprehensive study of misconduct ever performed in an American police department. Over the past few years, Kane has been part of a research team that is conducting a randomized, controlled trial examining the effects of the Taser on cognitive functioning. His team recently published the findings in a major cognitive psychology journal. He is now working on a manuscript that directly links use of the Taser and its impacts on cognitive functioning to Miranda issues and police interrogations. Kane was recently selected to participate in a new police commission in Fairfax County, Virginia, on the fatal 2013 shooting of an unarmed man named John Greer. The commission will focus on topics including police use-of-force policies and how the department relays information to the public. The panel also will delve into some of the concerns about police-community relations that were reflected in other nationwide protests that followed the police-involved deaths. Members of the news media interested in speaking with Kane should contact Alex McKechnie at ahm62@drexel.edu or 215-895-2705. ~ And good ones sometimes feel like they have to also and break their own code of ethics and conduct to cover for the bad ones. Or otherwise be labeled a rat and face retaliation. If any officer breaks the Law or Code of Ethics, he should not be shielded by the Police Bill of Rights. ~ What is more concerning and a national security threat, is what the bad apples do off duty, or on duty but off camera……………….? ~ Break the Code. Break the Culture.